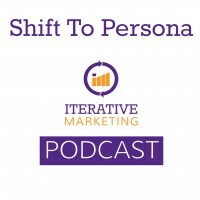 Persona-centric marketing is focusing on meeting the needs of the prospect or customer at a personalized level based on the information found in a persona: demographics, psychographics and where they are in the customer journey. Solution: Paint two pictures of the organization: one that shows what is broken now, and one of how things could look in the Utopian future. The broken picture highlights key elements of the customer journey that would benefit from persona-centricity. The Utopian future shows how the customer experience would improve as a result of changes to the customer journey and how that translates into lower customer acquisition dollars, higher customer retention etc. Solution: Focus on communication. Make other groups in the organization aware of the work you’re doing and invite them to participate early and often. Solution: Start with a briefing at the C-Suite level. Provide case studies from other thought leaders. Make the personas and customer journeys visual and easy to understand. Solution: Turn personas into a visual display for the entire team to see and make sure company-wide reporting includes references to the personas and customer journey. Also include references to education materials. Solution: Remember that persona-centric marketing can be phased in over time. It doesn’t need to be done all at once.